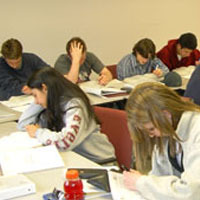 Statistics reveal that students who are most successful in gaining admission into competitive colleges of their choice, and students who succeed at receiving awards and scholarships to pay for their college education, are ones who involve themselves in serious pre-college training quite early. The whole process is not only very competitive, but also very complex and confusing for both parents and students. In order to succeed, every student requires a carefully organized and well-planned strategy. This is precisely the objective of our COLLEGE BOUND PROGRAM – a specifically designed, unique step-by-step program that guides both parents and students painlessly through the college journey maze. The program initiated by students in the summer before their junior year, culminates at the end of the senior year. However, students can join the program mid-way and take advantage of either specific services or the total program. Since 1990, our COLLEGE BOUND PROGRAM has helped thousands of students achieve their goals; each year we help over one hundred students realize their dreams. Regardless of whether one is a mediocre student or a well-adjusted, academically bright student, every student can succeed with our COLLEGE BOUND PROGRAM. Personal and committed, we offer students a program that cannot be matched elsewhere. In order to find out more about our COLLEGE BOUND PROGRAM, we urge you to set up an INFORMATION SESSION, The information is free and places you under no obligation to join the program so CALL US TODAY! You have nothing to lose. Let us help answer any questions you may have about our program. "...The return on our investment is immeasurable as our son now has the task of choosing from the nine schools he was accepted to.."
Serving students from the following states: Massachusetts, Rhode Island, New Hampshire, Maine, and Connecticut. Communities include: Attleboro, Barrington, Boston, Brookline, Cumberland, Cranston, Dedham, Foxboro, Framingham, Franklin, Johnston, Kingston, Lincoln, Mansfield, Manville, Milford, Natick, Needham, Newport, Newton, Norton, North Attleboro, North Kingston, North Smithfield, Norwood, Pawtucket, Providence, Plainville, Seekonk, Sharon, Smithfield, Sudbury, Taunton, Walpole, Warwick, Wayland, Wellesley, Weston, Westwood, Woonsocket, Worcester, Wrentham, and many other New England communities.